Duncan Hunter is the ONLY candidate that realizes what China is up to, both militarily with its rapid armament increases, and economically, with its long term strategy to undermine the United States’ industrial base. Hunter is dead set against the ‘one-way’, idiotic trade deal we have with the Chinese, will put a quick end to further technology transfers to the communist nation, and will build up our own military to the point that a Chinese invasion of Taiwan would be nothing short of a quick suicide mission for communism. All the other candidates tip toe around the issue of China. Hunter plans to step on their throat. 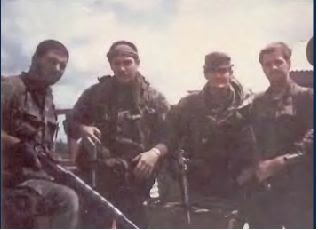 Photo: Presidential Candidate, Duncan L. Hunter is on the left with other Army Rangers in Viet Nam. Heyyah, Town Crier- I found your site lurking in the list of Duncan Hunter bloggers, at Go Hunter 08. Welcome to the winning side, bro~!